I enjoy changing up this framed chalkboard seasonally. Most recently, it had a spring time look to it. 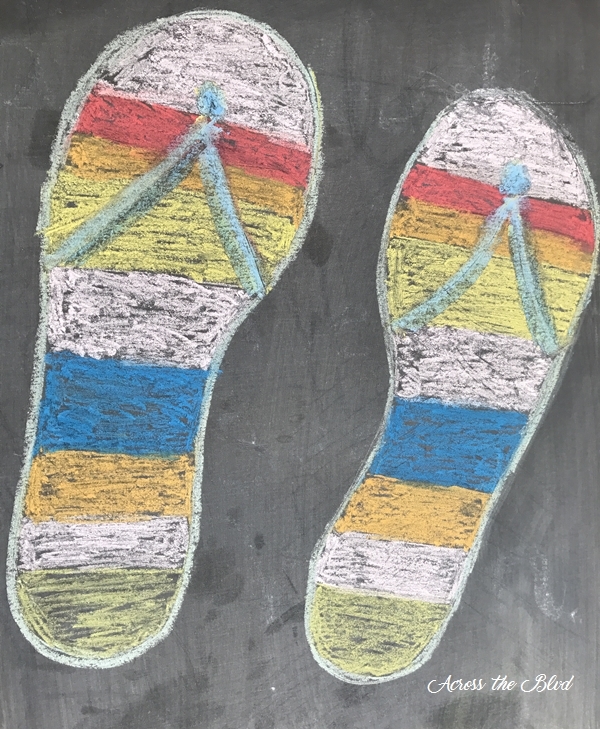 Now that the weather has warmed up-we’re hitting ninety degrees in Charleston this week- it’s time for a summer chalkboard. Gloria and I both live in flip flops for much of the year, but with this heat, it’s definitely flip flop season! I didn’t use any special chalkboard transfer methods. It’s quicker and easier to just hand letter it. It might not look uniform, but it works for me! I’m all about simple projects and this one delivers on that! I used a stencil of some sea shells to outline the shells near the bottom. I colored them in using white and peach chalk. I added a few waves at the very bottom. To draw the flip flops, I used a pair flip flops. 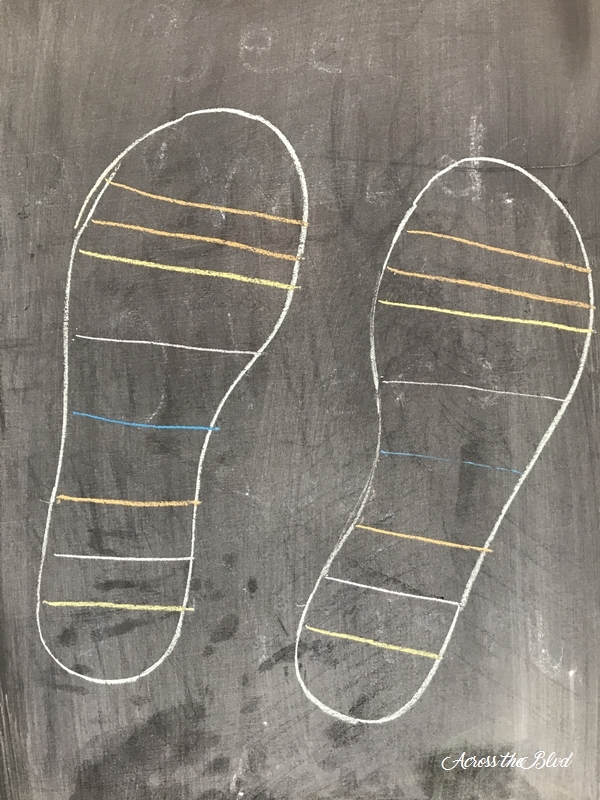 I just held each one up to the chalkboard and traced it. Then I drew lines to separate colors. I colored the sections in with colors in a random pattern and used a large piece of chalk to go over the outline again. Using block lettering I wrote “Flip Flop”near the top. I added “season” near the bottom along with the year. While I love the look of true chalkboard artists, I’m happy to just stick with simple ways to display a fun quote or picture. It fits in well in our Charleston Room which has lots of coastal decor pieces. It’s a fun piece to change up frequently and by just hand lettering, it doesn’t take long at all. This adds a fun touch of coastal decor and because it’s so easy to change it, I’m sure I’ll be changing it again before too long. This made me smile this morning! We live in our flip flops too! 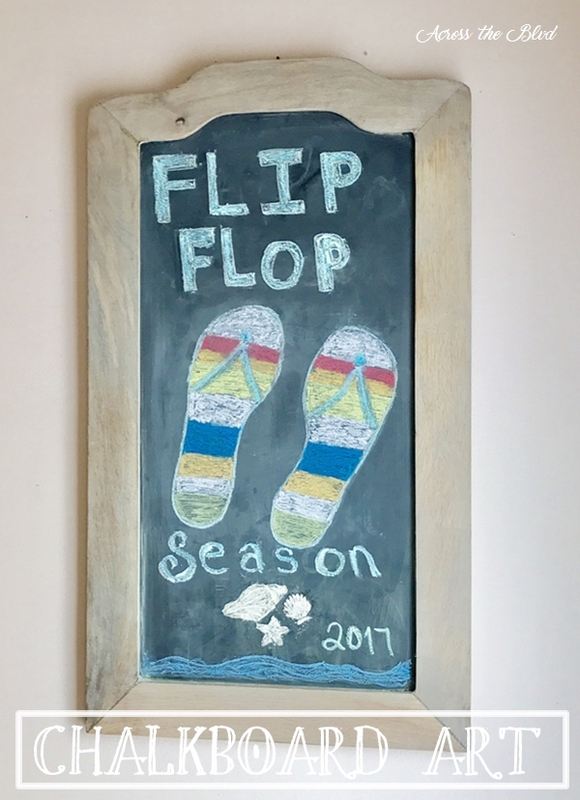 Super cute way to celebrate Flip Flop Season! 90 degrees already?! We are still in the comfortable 80’s, but the hot temps are just a few weeks away! Glad it gave you a smile! I’m enjoying it. Yes, we are close to record breaking temps here. It’s a bit early for that and it’s supposed to cool off into the lower 80s by the weekend. OH LUCKY YOU — living in Charleston! We fly in and out of there often as we vacation on St. Simons Island in GA and my brother-in-law and sister-in-law live on Johns Island so we visit them as well when we come down. 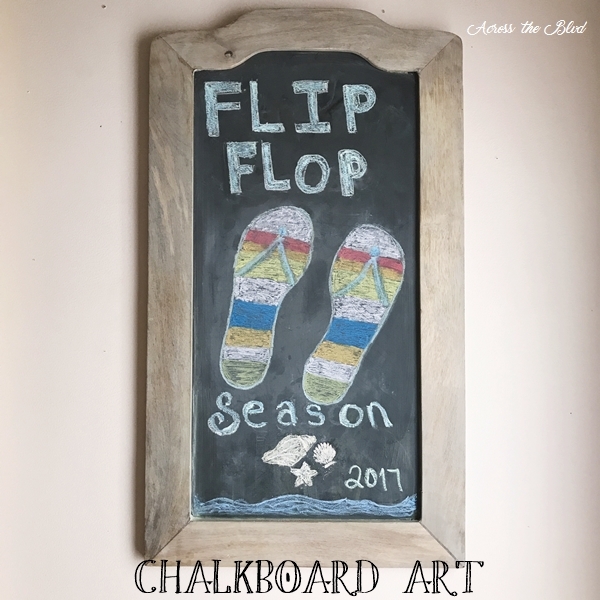 Your chalkboard is SO cute — I have one on my front porch and as soon as it IS flip flop weather here, I think I may copy your idea! We enjoy living in Charleston! St. Simons is a great vacation spot. Thank you, Lauren. I’m happy to have given you an idea! Thanks, Sharon! It’s a fun beachy decor piece. Thanks so much for pinning. Very cute and great drawing skills! It’s nice to have a piece you can customize for the season or holiday. Visiting from Snickerdoodle Sundays party. Thanks, Victoria! It’s pretty simple. I enjoy changing it up. Thanks for stopping by! Thank you, Joy. 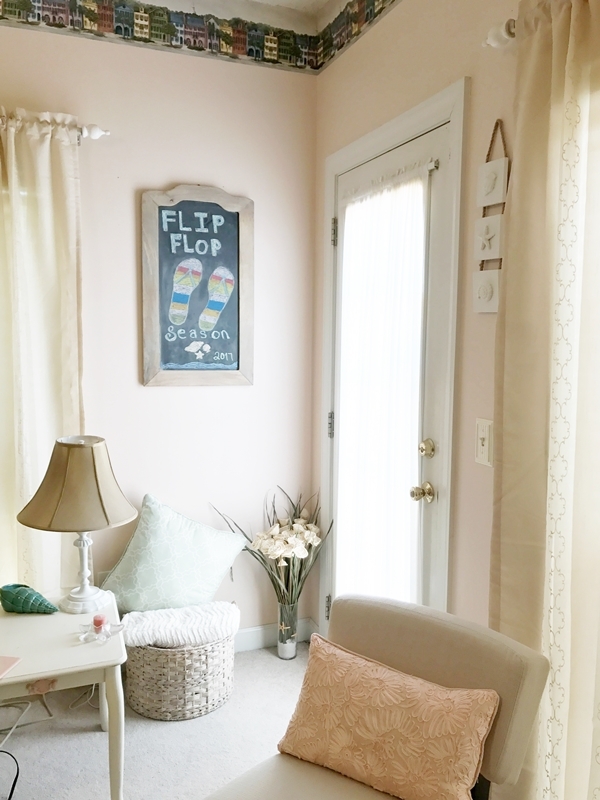 It’s an easy way add a little pop to that corner of my sun room. Thanks! I have fun with it! 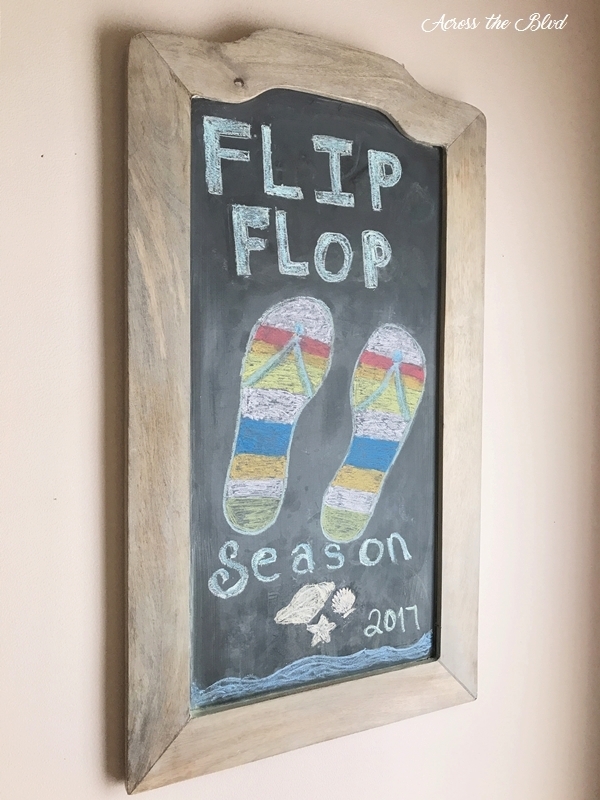 Such a cute idea and I am so thankful it’s now flip flop season. Love me some nice warm even hot weather. 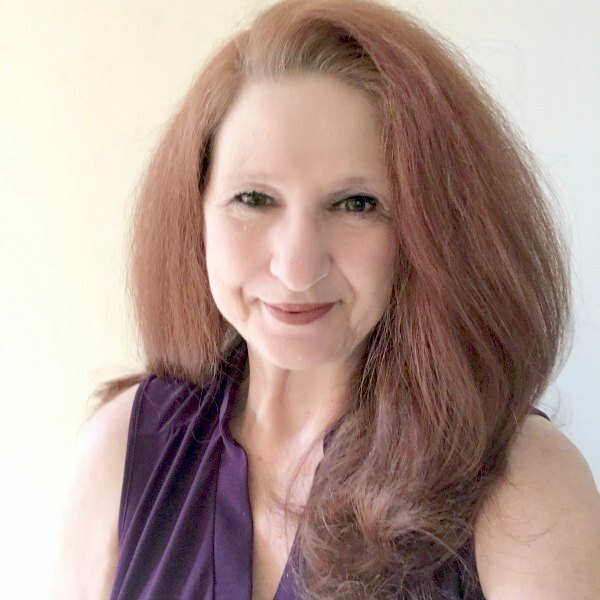 Thank you Beverly for linking up at the #BloggingGrandmothersLinkParty. I shared this post. Thanks, Dee! It was a fun little project. Thanks for the party and for sharing on sm. Such a fun idea! Thanks for sharing this at: #BloggingGrandmothersLinkParty. Thank you, Donna. Thanks for the party and the visits and shares. Love it! Thanks for linking up at #BloggingGrandmothersLinkParty! I’ve shared your post on social media. Thank you, Christie! I appreciate the shares! That’s so fun! What a great idea!! Thank you, Lori! It’s a fun piece to change up seasonally. Thanks for the party and for visiting! So cute! I wish I had your artistic talent. Thank you for linking up at #BloggingGrandmothersLinkParty. I’m sharing your post on social media. Thanks! I’m not sure about artistic talent! This was easy using stencils and the shoes. Thanks for sharing, Carol! This is the cutest!!! Such a creative idea. Thank you for linking up at the #BloggingGrandmothersLinkParty. I shared this post. Thanks, Clearissa! Thanks for the party and the shares. What an adorable idea. Love it. Thanks for sharing your wonderful posts at Over The Moon Party. Thank you, Beverly. It was fun to put together. Thanks for the party! So cute and certainly makes you feel like Summer. Thanks for sharing with us at #BloggingGrandmothersLinkParty I’m sharing on social media. Have a great week! Thanks! Thanks, too for sharing, Sue! When it’s 90 degrees uniformity goes out the window! 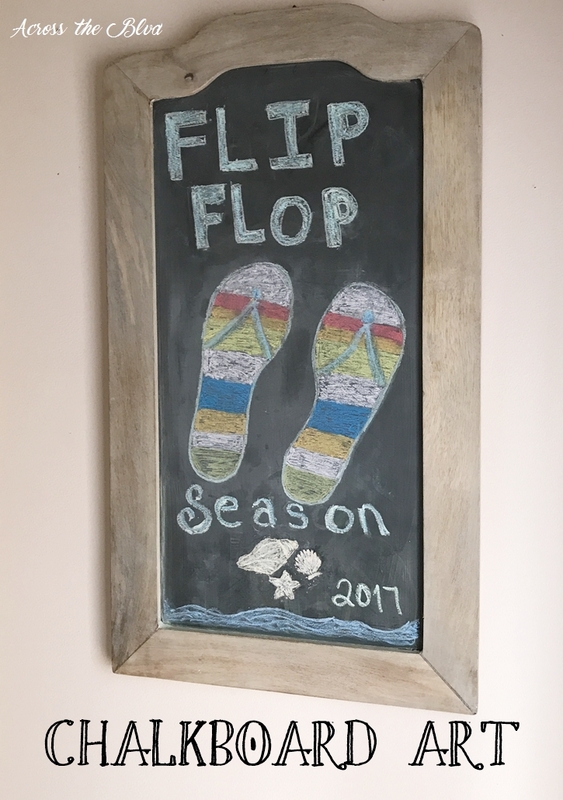 My daughter is a year round flip flop person also and she would love this. Thank you for sharing with us this week at Celebrate Your Story, and have a great weekend. It’s definitely been flip flop season here for a while. Thank you, Sandra. I hope you have a wonderful weekend. Thanks for the party! 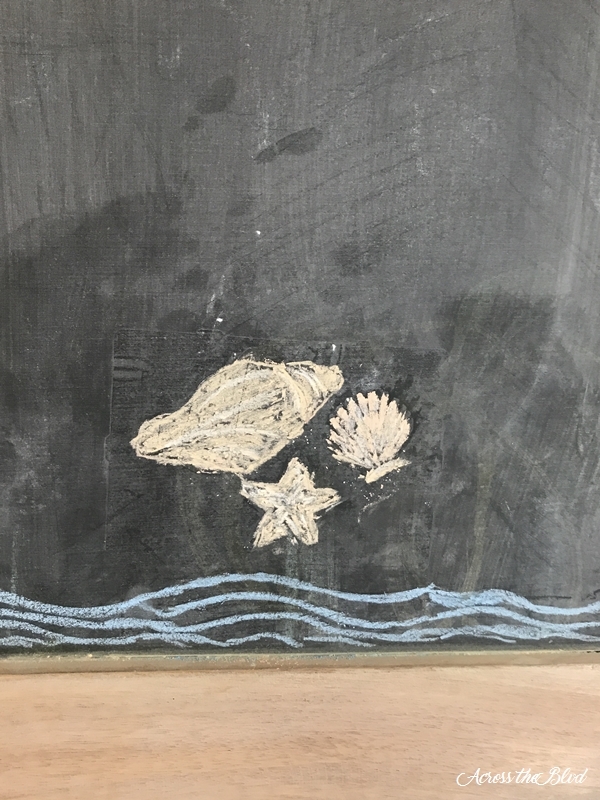 I love the chalkboard art as well, but I’m not very artistic! I think yours is as cute as can be. I’m either barefoot or in some type of flip-flop all summer long. Thank you for sharing at the #BloggingGrandmothersLinkParty. Keeping it simple is the key for me. I’m not very artistic either! Thanks, Teresa. Great project for summer! I love my flip flops too. Thanks for sharing on Sunday’s Best. Thanks, Rhonda! Thanks for the party! It looks so summerly! Thanks for sharing at Sew It Cook It Craft It! Thanks, Lina! Thanks for hosting the party!